I lazily awoke to the chimes of the Church bells, echoing through the trees to remind all those who heard that this morning belonged to Sunday. It wouldn't be long before the sounds of bicycle bells and children's laughter filled the streets or the whir of a lawn mower began; for a supposed day of rest everyone seems to be up to something. For me, Sundays are Pancake Days. My morning begins later than most; I won't rise on a Sunday until the Sun has been up for at least a few hours, sending its golden arms throughout my home to dust even the coolest of corners with dazzling warmth. After a mini facial and stretch session to rival that of a cat's, I saunter into the kitchen, putting the water on to boil as I unhurriedly gather my pancake ingredients. With a few tips of the hand, whirls of the whisk and melting of butter, I happily spoon unctuous oatmeal-coloured dollops into the pan and serenely sip my cup of tea whilst I listen to them sizzle softly as I gaze out the kitchen window to watch the leaves quiver in the wind. With the final pancake placed atop its tower, adorned with its necklace of creamy banana slices and its gleaming honeyed crown, I call out to my husband to awake from his lengthened slumber - his breakfast awaits. 1.25 cup milk (add more if mixture is too thick). Sift the flour, baking powder, ginger & sugar into a bowl. Stir in the cocounte and make a well int he center. Add the combined eggs, ricotta and milk. Mix until smooth. Heat a frying pan over a low heat and grease lightly with a little butter. Pour 1/3cup of batter into the pan and swirl gently to create an even pancake. Cook until bubbles appear on the surface, then flip and cook for another minute or until golden. Repeat to use up batter. 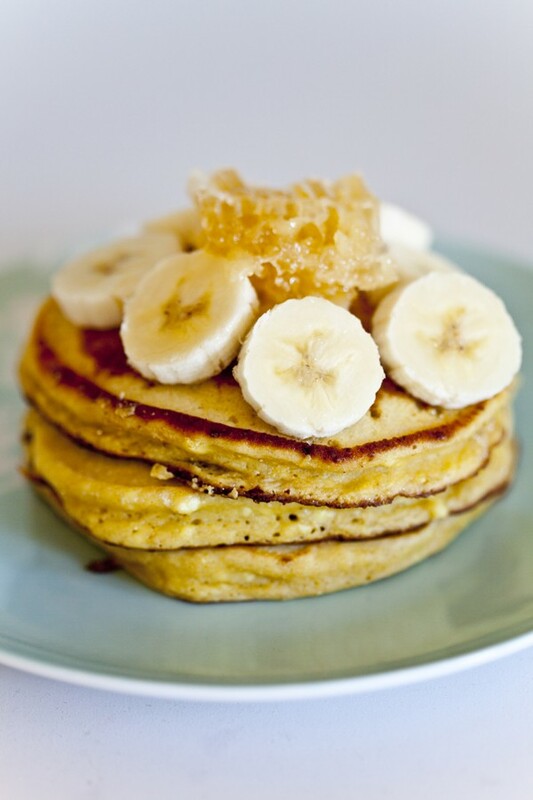 Stack three pancakes onto each plate and top with sliced banana and honey. cooking time: 15mins to cook 6 pancakes. taste: 4/5. Fluffy dreams, with a hint of the tropical and touch of spice. In the photo above, I used regular flour as I was all out of wholemeal spelt, but they are lovely with either flour. I wasn't sure whether I would enjoy the ricotta cakes paired with warm ginger and chewy coconut, but I was pleasantly surprised. When topped with fresh banana and sweet honeycomb, these pancakes are rather delicious in an unexpected way. A great breakfast treat! So yummy. Love, love, love pancakes for brekkie! Oh this is killing me as I haven't had breakfast yet and thus am hungry too. Love the addition of honeycomb and I know from experience that ricotta pancakes rock! What a gorgeous stack! And those flavors...ginger, coconut and honeycomb! Yum! Oh my, these pancakes look fantastic! Even though I just finished breakfast looking at them is making me hungry! I am now craving pancakes for the weekend. Your Sunday mornings sound delightful. Oh, that looks amazing! I have to try this recipe! sundays have always been pancake day for me too, but i've never had a batch as unique as this--well done! How beautiful and delicious looking! I haven't made pancakes for far too long but you've totally got me craving them. I love the honeycomb on top - so decadent and wonderful.